Take 42% off the entire course. Just enter code slzeigermann into the discount code box at checkout at manning.com. 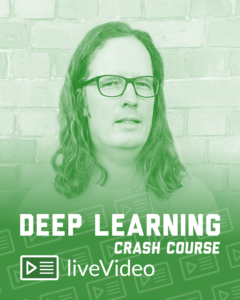 In this liveVideo course, machine learning expert Oliver Zeigermann teaches you the basics of deep learning. This powerful data analysis technique mimics the way humans process information to identify patterns in your data and learn from them. With Oliver Zeigermann’s crystal-clear video instruction and the six hands-on projects in this video course, you’ll get started in deep learning using open-source Python-friendly tools like TensorFlow, scikit-learn, and Keras. 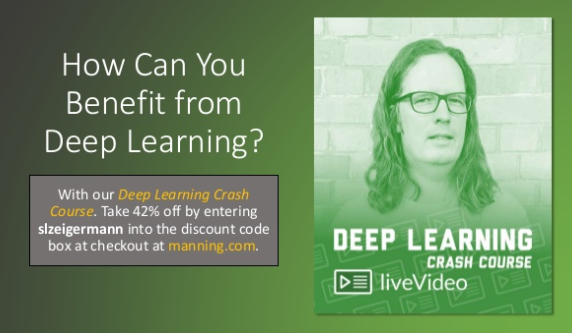 If you’re ready to take the fast path to deep learning, Deep Learning Crash Course is for you!